The use of cut bait, meaning taking a large fish and making from it small pieces suitable for putting it on a hook, was very much a seasonal thing – the season being the low-water times when th e water was warm and relatively clear. It really was a coincidence of the life cycle of catfish and the attractiveness of shrimp as food that made the use of cut bait necessary. Huge numbers of young catfish are produced during the spring in the Basin and these young fish are voracious consumers of shrimp, prompted perhaps by the warm water and rapid growth. As the water-season brings low water in the summer, these swarms of now three and four-inch baby catfish will clean shrimp off of fishermen’s lines almost as fast as they are put on, especially in daylight hours. For this reason what is called “hard bait” is used by the fishermen instead of shrimp, and cut bait is what makes up that category. When the water got low in the summer, and warm and clear, there were really two options for fishermen like the Myette Point folks. Either they could switch to a hard bait that would not be stripped off by small fish so easily, or begin fishing only at night to avoid the swarms of small catfish. For some reason, shrimp would not be removed by small fish as quickly after dark and so people would fish their lines from dark to light during low water. The other option was to use cut bait instead of shrimp, or maybe a combination of the two. Fishing at night would also avoid the dangerously hot summer sun. Skin cancer was always an occupational hazard for line fishermen. EJ Daigle did a lot of linefishing and he is familiar with what happened during the beginning of the low-water season. As an alternative to shrimp, sometimes people would use whole small shad, putting one to a hook. When asked about using these small shad as cut bait he says sometimes it is even necessary to find a harder bait than small shad when the baby catfish are really aggressive. He talks about small shad and what happened when even these were removed, or stolen, by small catfish. That is a clear- water bait. Use it when your Basin is falling, and the water is beginning to clear. When your shrimp won’t hold [on the hooks] anymore, when your smaller fish, small eel cats and small blue cats will just tear the shrimp off the hook in two or three minutes…. As your water clears up, your smaller fish will quit jumpin on the shrimp and [also] go to peeling the shads off fast as you put em on. So you gotta go lookin for a harder bait even. This harder bait would have been larger shad cut in pieces or mullet, or something like that. Eight species of animal were used as cut bait, seven fish and one amphibian. The amphibian was a salamander called the Lesser Siren, Siren intermedia, known to fishermen as “ansoir”. The spelling here is guessed at from the pronunciation. This salamander was common enough along the estuary marshes on the southern margins of the Atchafalaya Basin to be caught and used for bait, though this is not generally known. It was mainly found in the soft mud of shallow marsh ponds and was caught by pulling a net through the top few inches of soft mud. It was a popular bait when available. Lena Mae and Edward Couvillier fished with it sometimes near the coast. EC: We used to go get them ansoirs [sp?] when we fished in the bay, out there. LC: Ansoirs [are] good too. Made like a eel. But it looks like it got a rough skin on it. EC: Got like lil legs on the side of it. LC: That used to be a good bait. EC: We used to go back of Belle Isle, they had a lil lake back there…They live in the mud. And you go back there and dip in that soft mud, and that’s where you catch em. Just like a cut bait. The other baits (all fish) were, in order of most popular to least, fresh water shad, mullet, buffalo, saltwater shad, slicks, black eel and perch. A few of these names were in common use by Myette Point fishermen but are not so common elsewhere such as black eel (American eel), saltwater shad (pogey or menhaden) and slicks (skipjack herring). 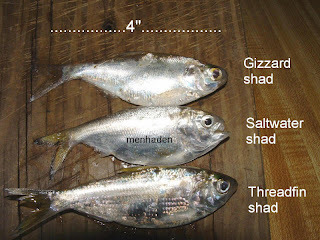 Two species are usually included under freshwater shad – gizzard shad and threadfin shad, with the former the most common. Freshwater shad seem to be one of the most abundant bait fish in the Basin. Of the eight species used, shad were the only cut bait whose availability could be relied upon. It is not consumed by humans as food, although similar species are held in high regard as table fare in other parts of the United States. 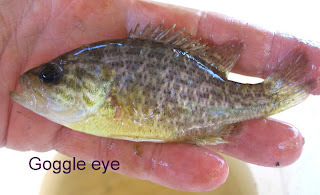 It is caught either in castnets or dipnets and can be used whole, if small enough, and if so is threaded onto a hook passing through the eyes and then back again near the tail, a baiting technique called string shad. This makes a curved bait that wobbles in the current. Or, if the fish is too large for this, it is sectioned into “steaks” ½ inch wide and put on the hook that way. 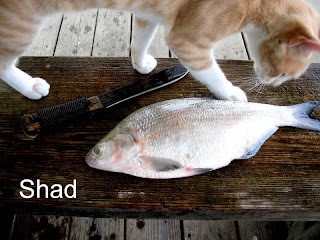 This is a very effective bait because shad seems to be one of the most foraged foods by fish in the Basin, second only perhaps to shrimp. To catch them, Myette Point people know that wherever you find a current flowing around a point, there you will find shad swimming upcurrent, and if you stand where you can sweep a net along the current you will usually catch them – especially the smaller ones. 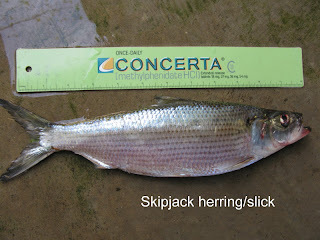 If needed, larger shad were usually caught using castnets in dead water areas like oilfield location canals. 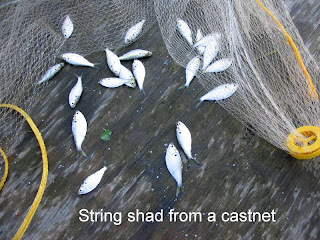 When talking about the uses of castnets, Edward Couvillier says: We always used em to catch shad. Mullet were more of an opportunistic bait than shad. They were very good as cut bait but were only caught infrequently in sufficient quantity to be the sole bait used, whereas shad could often be found in large numbers. As with all of these, the skin is a necessary part of the bait – always being the factor that keeps the bait from being easily taken from the hook by small fish. Using a castnet along the sandbars was the usual way to catch mullet, often after seeing the schools “piping” on the surface. Neg Sauce liked to use mullet when he could get and it was the right season. Buffalo are also a good bait, but here again availability was not assumed. 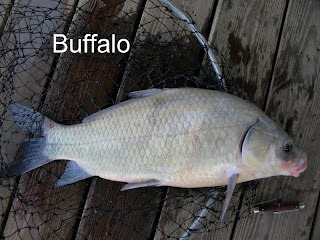 Actually, aside from shad, all the other things used as cut bait were either used in combination with each other or very occasionally used alone – and this is how buffalo was used also. To bait with this fish most people would scale it, fillet the meat from the sides, leaving the skin on the fillets, and cut the fillets into one inch cubes or less. From something like a four-pound buffalo it was possible to get about 100 good baits. With a normal rig of 1000 hooks it still meant you had to have ten four-pound buffalo to bait just once, and that usually meant you had to be at least a part-time hoopnet fisherman, or knew someone who was. For this reason buffalo was not that popular. In the latter years that they fished, Myette Point people had access to salt water shad. During the early generations, many of the fishermen lived on the east side of Grand Lake and for some reason these salt water migrants were not common on the east side. But once they moved to the west side, around the 1940s, it became possible to harvest menhaden/pogeys during low water periods. 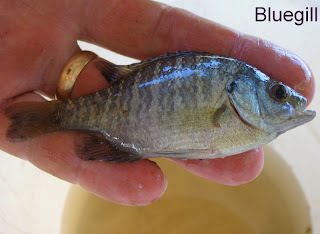 These normally salt-water fish come up rivers into fresh water during periods of very low water. Russell Daigle has used these shad for many years and he says they are usually available every year. When the surface of the river is calm, they can be seen rippling the surface in huge schools, and, if approached carefully and quietly, one throw of a six-foot castnet can catch many hundreds of three-inch fish. The net comes up from the depths of the water literally white with the silver shad caught in it. This is a wonderful sight to see if you need bait and have had trouble getting it that day. Most of these fish are small enough to be baited using the string method described above. Often the tails are cut off to keep fish from stealing the bait from the hook without getting hooked. Black eel was often available but seldom used. It does not seem to ever have become popular, but was never quite abandoned either. More often this bait was used along the coast in estuarine waters than in the Basin proper. But some people did use it in the way described elsewhere, i.e. as an attractant to shrimp which in turn attracted fish, and sometimes for cut bait for its own sake. Having been caught most often as bycatch on commercial hook and line rigs, it was sometimes kept for periods in live boxes either to sell to other fishermen as bait or to use later. EJ Daigle used eels this way. Spot bait means putting a certain kind of bait every ten hooks or so. 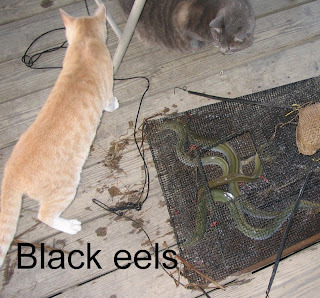 NS: It never was too much up the lake here – eels. But I remember we used to save em and people that used to fish out in the bay, you know, would buy em. NS: Yeah, used to put em in a cage. Norman [Daigle] used to come get some. Norman used to fish out there in the bay, after they had moved [to Calumet]. And uh, sometimes we’d save em, put em in a cage and keep em. [in case] Somebody need em. JD: But you never had much luck with em [as bait]? NS: Never was much…in this lake. Now and then maybe you’d catch a few fish on em, but it wasn’t the best bait all the time. Slicks were highly prized but never available in sufficient numbers to become an important bait. This herring was sometimes caught when the real object was to catch shad and it was used whenever that happened. There seems to have been a real positive relationship between how bloody a cut bait was and how effective it was, and this one was bloodier than most. For this reason this fish is very popular as commercial crawfish bait when it is available. The Myette Point fishermen sometimes referred to this fish as a “lil tarpon” and it does resemble a tarpon superficially. There is clear memory of tarpon at Myette Point because in the early 1900s, tarpon were not uncommon in the Basin and young ones are still caught by hoopnet fishermen today. 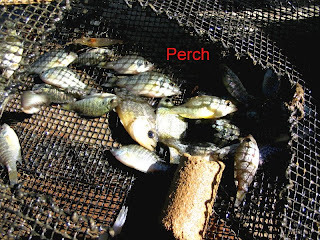 The least-frequently used cut bait was the small panfish collectively called perch. This bait is placed last because it is unusual in that it was always available but not utilized as cut bait by many people. Maybe this is because it wasn’t easy to get in large numbers, like with others listed above, and maybe because in some people’s opinions it didn’t work very well. Oddly, there are interviews that mention good results with cut perch from the 1920s, but only occasional mention of them in later decades. Most of the time they were used as live, not cut, bait. 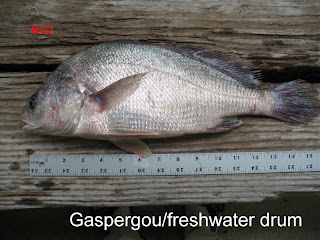 Lastly, the fact that gaspergou (freshwater drum) was very common and was not used as cut bait needs to be mentioned. This fish is the opposite of the slick mentioned above in that it is almost bloodless when filleted. Edward Couvillier confirms that that gaspergou isn’t any good. So to summarize, cut bait was an important bait to use when shrimp would not work because it was removed from the hooks too quickly by small catfish. This was often the case in the summertime when the water was low, clear, and warm. Cut bait, or “hard” bait, could be relied on to stay on a hook long enough to be there when a sizeable fish came along and was hungry. Otherwise, if baited with shrimp, the hook would be empty when that opportunity presented itself. The river has had the bottom drop out. It is at 6.4 feet on the Butte La Rose gauge today, heading down to 5.6 feet day after tomorrow. It has dropped so fast from 11.5 feet that my dock is high and dry on the bank for the first time in ten years. I am ALMOST sure we can count on some more high water this spring to float it off – almost sure. The Ohio and Mississippi are bumping up a little bit now but nothing big to push the water back up to where it was a couple weeks ago. Oh well. Back in the early days of the Myette Point experience, from about 1910 to 1950, fishing for big fish was the primary occupation for commercial line fishermen. The big fish would provide the greatest return “per unit effort”, as they say. You could set lines that were designed for big fish and make a living with relatively few hooks. In the days of cotton line, which this early period was, these smaller rigs of line were all that was possible. Smaller fish would accomplish the same thing in larger numbers, but that took a lot of line and a lot of bait, and a lot more effort of frequently changing lines and hooks because of the cotton. The primary way to fish for these big fish in the early days was to use bushlines. These individual sets, one line hanging from one branch, could be targeted to the locations where big fish were known to be – i.e. near stumps or other debris. Joe Sauce remembers what you used. Once a set like this was made, the choice of bait was almost always something that was alive and so could attract a predator with movement. And predators they were, these big catfish. The flathead, or goujon, is generally the top predator in slow waters. Perhaps the garfishes qualify also but even with the terrible teeth they have, I don’t believe they are as feared by other fish as is the goujon. This big catfish hunts only live things. It is so known by other fish that people who run hoopnets will tell you that once you trap a goujon in a net, few other fish will enter that net. Even small flatheads/goujons in a net will keep other fish away. Perhaps it is the smell that tips off other fish to their presence. Big blue catfish are also drawn to live prey, and can be caught with the same lines as are set for goujons. Neg Sauce was one of the early Myette Point fishermen and he recalls how live bait was an important thing. The boats in those days all had “wellboxes”, bulkheaded sections in the midsection of the boat that could be filled with water to keep fish alive. The perch were put in this until they could be transferred to a holding box in the water near the houseboat residence. Russell Daigle had early memories of how they did this as a family. RD: When I was a kid, that used to be a daily routine. When I was eight, [or] ten years old , I guess. Uh, the Old Man, every day, me and him and Momma. Get in the boat and go up the bayou. Find a brush pile somewhere and sit there and catch two or three hundred. …fish goujons with. JD: What did you use for bait to catch the lil…? RD: Shrimp. Lil bitty piece of shrimp. You peel the shrimp and squeeze a lil piece out and put it on a hook. Oh yeah. Regular as a clock. And in a different family, elsewhere on Grand Lake, Lena Mae Couvillier tells how they did it when she was child. LC: We had a shrimp box [back at the houseboat], and then daddy put a box to put perch in…put perch in, keep perch live. We used to…every day…we’d load up, run up the bayou…we’d go to first Diamond Slough…we’d run up there in the boat. Sometime we’d tow a pirogue…well, I didn’t want to fish with the rest of em in the boat, so I tow me a pirogue. Fish out of a pirogue, by myself. Momma and them would fish out of the boat… ‘Till we’d get enough perch, keep em live, come home, put em in the box. Next day, Daddy’d go bait his lines with that. JD: Well, did yall fish…what did yall fish those lil perch with? LC: Oh, a lil perch line with a perch hook. Any pole, you can find, and cut you…them days you could cut lil poles anywheres. Tie you a line to it, and fish perch. Every day, we used to run up the bayou and get our load of perch. JD: So, yall’s job was to catch the perch and he would go and put em on the line? LC: Bait with em. [They went] After dinner. We’d all take off after dinner and catch our perch. That was me and Momma, Daddy, Milton…four of us. JD: So…so Myon [her father, the head of the family] would help, he would go and catch perch too? Since the main idea was to keep the bait alive and present it that way to the catfish, the bait was connected to the hook in the way least likely to do serious damage. Most of the time this was to attach the hook through the skin just ahead of the dorsal fin of the perch. It was left, then, to swim freely as far as the stageon would allow. The practice of hunting a land-dwelling predator by tying a goat to a stake as bait is similar. The other things that were used as live bait were mullet, shad, small choupique (bowfin) and shrimp. The latter were used in two ways. In one way, four or five of the bigger shrimp were hooked through the tip of the tail, the whole wriggling group of them acting to entice a large fish, or in the other way, a piece of cut bait would be allowed to stay on a hook until it spoiled (soured) and began to attract shrimp. The big catfish would take the shrimp on the soured bait and get hooked. The days of using live bait did not last much past the 1960s. Live bait was a practice designed to catch large fish, but the market for large fish began to decline due to the increase in availability of farm-raised catfish. These could be marketed in uniform sizes and were always available in any volume needed by restaurants. The big, wild fish were not uniform nor were they always available on demand. As the sales for big fish decreased, Basin fishermen began to rely more and more on rigs that would produce large numbers of smaller fish – rigs made of crosslines and bentlines. These smaller fish were still marketable until the last few years. Recently, however, even the smaller fish were not wanted by the few remaining docks that bought and sold wild fish. There are still a few people who would catch the wild fish if there was a sale for them, but the last dock that purchased wild fish in the Franklin/Jeanerette/Charenton area closed its doors last year. The river is at 11.1 feet on the Butte La Rose gauge right now, falling drastically to 8.3 by the middle of next week. The Ohio and Mississippi are both falling. Whatever water was in the swamp due to this last rise is about to disappear. Too bad. Since any story about the linefishing practices of the Myette Point community of fishermen in the Atchafalaya Basin has to involve the bait they used, the bait they used is the next important topic. Having now spoken of the various types of line rigs, it is time to consider the bait. As a matter of fact, for the fishermen, bait is usually a more difficult issue to deal with in the consistency and quantity needed than setting the lines themselves. It is a maxim of good commercial line fishermen that you never run a line unless you bait it too. You don’t just take fish off and leave no prospect of having fish on the line when you come back. So bait was always part of the process of running a line. Even if it had been affordable, for the Myette Point fishermen there was no commercial source for bait. Even if there had been, there was no bait that could have been purchased with the consistency and in the quantity needed. So some means of procuring natural bait was the norm for these fishermen. During the decades that the techniques of linefishing were practiced and refined in Grand Lake, numerous types of baits were tried and the best manner of their use was identified by trial and error (and success). Each of the successful baits was somehow limited by season, primarily those seasonal factors that either defined low water periods or were defined by them, i.e. low water season produced clear water and muddy water came with high, and cold, water. Of all the baits used in Grand Lake, and there were 13 of them in all, only one, the river shrimp, was used successfully in all conditions. One reason for this is that the river shrimp was procurable all year long whereas none of the others was. The other reason is that catfish seem to take this shrimp as food when no other bait will interest them. Each of the other baits, however, had a specific time and reason for their use. 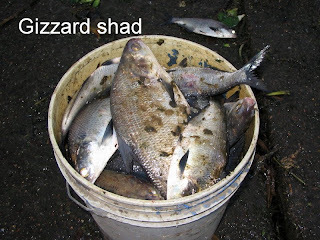 Shad, for instance, were easy to get at a time of year when shrimp were harder to get. For the record, the other baits used were American eel (“black eel”), spotted worm eel (“white eel”), freshwater shad, saltwater shad, mullet, crawfish, sunfish (“perch”), baby bowfin (“choupique”), buffalo, skipjack herring (slicks), siren (a salamander) and soap. The soap was P&G brand and was perhaps the oddest bait used. 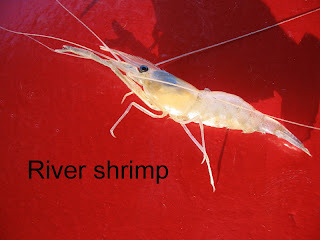 River shrimp (“shrimp” from here on) have the scientific name Macrobrachium ohione, meaning the big-armed shrimp from Ohio. Apparently they once lived in the rivers of Ohio and surrounding areas but not so much anymore, and for the other part of the name they do have enlarged (macro) pinchers, or “arms” (brachium). Now virtually absent in the upper Ohio watershed, they have, however, maintained their abundance in the lower Mississippi valley, including the Atchafalaya River. They have been available in the Atchafalaya Basin for the Myette Point fishermen to use for as far back as memory goes. How important shrimp were to the lives of the fishermen is summed up by Edward Couvillier. EC: Well, shrimp, is a year around bait. That’s a year around bait. You can use that anytime. That was a good bait. JD: Would you say it was your basic bait that you used? EC: Aw yeah. Well, it’s still a year-around bait, you know? And Neg Sauce adds his words in agreement. Different times…different times, use different baits. Like in the winter, shrimp is you best bait. …Always…it always was the best. The quantity of shrimp needed varied with the fisherman and the extent of his rig. In the early years of the last century, people set and ran fewer hooks than in mid-century. This was partly due to the difficulties with cotton line. But later, after nylon was in common use, the number of hooks for any successful line f isherman rose to at least 1000, with two or three times that for some, and the need for that daily number of shrimp rose with the hooks. I did a quick calculation of how many shrimp a fisherman would have used during 20 years of fishing and the number comes out to over five million. The river shrimp reaches full growth at about three inches but most of those caught for bait are less than that, being about one and a half to two inches long. There is some evidence that they had a place on the table but that may have been limited by the fact that they are mild flavored and rather small for human consumption. There are several ways to catch them including bushes, boxes, burlap sacks, wire traps and dipping the submerged roots of trees. The most common way, and least laborious in the short run, was the use of myrtle bushes. Neg Sauce was born in 1924, and he vouches for the fact that shrimp bushes were the way you learned to catch shrimp. JD: That’s how you learned, when you learned, was with shrimp bushes? So it’s been around a while, huh? Fishin em just like we fish em now? NS: Aw yeah, far as I remember. [laughs] Just like we do now. You hear people talk of willow bushes, or “dips”, but the Myette Point fishermen used wax myrtle instead of willow. Wax myrtle is an evergreen shrub/tree that grows at the edge of a forest and/or along a river edge. The terminal branches tend to be very brushy and dense and even under water the dark green leaves adhere to the branches longer than those of willow. These myrtle branches were tied together into a thick brush ball and suspended in the river from poles cut and stuck into the bottom near the shallow bank at an angle of about 45 degrees. Usually in about three feet of water, the bushes were set to han g from poles and just clear the bottom a few inches – enough room to get a net under them without alerting the shrimp in the bush. The poles were traditionally made of willow because that was the most abundant tree that grew in the right shape to use, i.e. long and straight and narrow all the way up. A 15-foot pole would have a base only two or three inches wide. That has changed so that now a fisherman would have to use either sycamore or Chinese tallow for poles because of the taste that beavers have for willow. Beavers don’t seem to like the bark on either of these trees. So maybe there is some good use for the Chinese tallow after all. These bushes were dipped up in long-handled nets with rims 36 inches wide. At times it was necessary to string out 50 or even 100 of these bushes to assure the fisherman of enough bait. Later on, when ¼ inch hardware cloth became available, it was found that traps made from this were also effective. Some of these traps are shown here, as is granddaughter Ava Rose getting a serious look at river shrimp. The river is at 11.5 feet on the Butte La Rose gauge, down from 12.5 feet last week. The Mississippi and Ohio are both falling hard so it looks like this water will fall out of the swamp and the crawfishermen will have to wait for more help from above. Once in a while you get a chance to do something really special, and it’s all due to someone else’s generosity. That happened last Monday to me, courtesy of my friend EJ Daigle (not initials, that is his first name). EJ and I have been friends for about 37 years and I have never stopped learning from him in the time we spend together. This occasion was a scouting trip into the deep old Basin, the purpose being to scout the earliest signs of swamp crawfish. EJ is one of the most productive fishers of wild crawfish and that respect doesn’t come without effort. These men who consistently come out of the swamp with 50 to 60 sacks do a lot to earn them, including finding the early places where the crawfish show up. That’s what he was doing this 5th of January, 2009. I told him that I wanted to come along to take pictures and do some interviewing on tape if I could. No problem. The morning wakeup was around 4:30 in order to make it from Butte La Rose to the Myette Point boat landing by 7:00. On the way down the levee the weather was warm and fog is predictable on warm January mornings. It was so. And then it began to rain, not a lot, just a drizzle, but ominous. We were to be out most of the day and I had an untried rainsuit. It was a well known brand, but not a commercial suit. It is named after an amphibian. I got to the landing before daylight and EJ was already there with the boat in the water and the motor running. He had his rainsuit on, the kind you see them wear on The Most Dangerous Catch. I put mine on and felt a little sissified. It kept raining. We put out just at daylight and right away you get from the land to the main channel of the Atchafalaya River, and the temperature changes about 15 degrees, downward. And if you wear glasses the world becomes a blank, gray haze. You clean your glasses with a wrapper from one of your peanut butter sandwiches and they fog up again right away. Again, the same. Some things you can’t fight and win, humidity on warm eyeglasses in cool weather seems to be one of them. The rest of the trip in the channel is without glasses and is agreeable. It is still raining, but not hard, just steady. EJ wonders if my rainsuit will work OK. I say of course, it cost $80, it has to be good. We are going to the east side of the Basin and into the Old Swamp. There is a great deal of Old Swamp there on the east side. Bayous with names like Pigeon, Sorrel, Long and Chene live there. The old cypress/tupelo swamp on the west side is just a fringe along the levee by comparison. Still pretty, but much less extensive. They say you can’t cross the Basin from west to east where we are now, but a small channel with fast running water opens up before us at the far end of an oilfield canal, and it does become possible to cross to the other side using this little twisting almost whitewater canal. Maybe this little waterway through the sandbars and willow thickets has had help in becoming useable. Maybe the Corps of Engineers didn’t help it. Who knows? But it carries us to Thibodeaux Chute and then on to the Crevasse and low and behold into Schwing’s Chute and then out into what is left of Grand Lake on the original eastern shoreline. There is more left of Grand Lake on this side than I thought, some places a half mile or more of width. But there they are, the cypress tree sentinels, extending themselves out into the lake from the Old Swamp side for hundreds of feet and living out there in the open water as few other trees can. In this dreary, gray, warmish situation the trees look oddly dark and permanent, like black statues on lawns, standing individually with space between them so that each is alone. It is still raining. My camera is screaming from inside the waterproof 5-gallon bucket that keeps it dry. Surely that picture of black sentinel cypress trees would be here right now, if I had risked a wet camera. I didn’t. 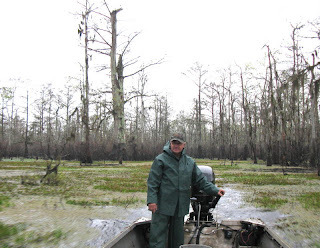 We go into the swamp along a set of bayous that places us about halfway up West Fork of Little Bayou Long. This is wild swamp, but not so wild as before the big outboard engines could and would bring anyone to see this place, no matter how spiritually undeserving. You know it’s not, but it feels violated, especially on a morning like this in the mist and rain and clouds resting just above the treetops. A closeness lives here in this weather. EJ does now what he and others like him do, he turns away from the bayou channel and dives gently into the swamp, boat, motor, us and everything. Right away the gently is forgotten as he hits the first underwater stump or log. The Mercury roars and we are propelled past the problem and out into an open area, engine and boat still intact. It is still raining, harder. And it is midmorning. We have stopped several places in the deep swamp for EJ to get out of the boat in a shallow place (ha, max depth is about one foot right now in this whole swamp – the Mercury roars frequently). He uses a little dipnet to sample vegetation to see if the old mother crawfish have come out of their holes and released their broods of baby crawfish. He finds some evidence that they have done this. He shows me inch-long baby crawfish snapping their little tails in his palm. He is pleased. The trip is worthwhile already. I feel some coolness beneath the rainsuit in the region of my chest. It is not what you wish to notice out here in the rain. I take a mental survey of my anatomy under the clothing I wear. I am sitting in a puddle of water on top of an ice chest. The puddle keeps being refilled by the constant rain, no help for that. Standing up instead of sitting in this boat is not an option, each time the Mercury roars is launch time for anyone not firmly holding onto something solid. But the sitting part of my being is dry! Well, the fancy fabric works. My back – hm, warm – dry. My shoulders, the same. Legs, same –dry. Then what is the problem? By now the coolness has spread down to below the beltline in the front. Oh, now I get it. It is the closure on the jacket. It is a zipper covered over by a snapped down flap. Normally that is not problem. But the zipper is leaking in the constant rain, which varies in intensity from hard to just a sprinkle. But all suits close in the front with a zipper or snaps, don’t’ they? Yes. But that is not the problem, the problem is with the pants. The pants on a REAL rainsuit come all the way to the top of the chest with a bib. It is expected that the jacket will leak, but if the leak comes through all it can do is wet the outside of the bib and run down the front, still on the outside of the person inside. My fancy rainsuit has no bib. It ends in front with a stylish pullstring closure right along the wasteline. No bib. And I am wet all down the front. From having spent many days out in the elements fishing for a living, some of them much wetter than I am now, I have no problem with being wet. Being cold is another thing. We have about half a day to go on this trip. Sometimes you can anticipate things worse than they are or will be. Best not. So I take a further simple assessment, asking, am I wet? Yes, all down the front. But, am I cold? No. What am I doing all this assessement for then? I realize what I am - is uncomfortable. I am out here in the middle of the greatest natural environment I have access to with one of the most knowledgeable men I know, and I am uncomfortable. Can I live with that? You bet! Off we go, it is still raining. EJ crosses several miles of Old Swamp between West Fork and M iddle Fork by going right through it. No landmarks, and not even any sun to show direction. There are places in there where TV survivor personalities might not come out. But what country! In one spot you could see ten of those ancient “wolf trees” that the loggers chose not to cut because of some defect. These trees seem to be like things that hold treasures of history for us and future generations. They will all be gone someday, but not yet. One of them is behind EJ in one of these pictures. It has a double trunk beginning about 20 feet up and that is what may have saved it for us to see. So, he hit Middle Fork and then found his way through bayous and such to the channel of Big Pigeon, down that to Grand Lake again and then up a few miles. We stopped to see a jugline that was bobbing up and down vigorously in the rain. 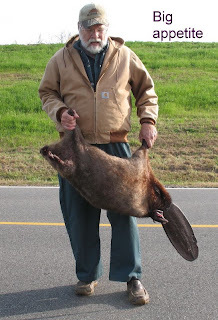 On the hook was a 20-pound goujon. No camera. We let it go and turned west into the land (sandbar) that sits out from the old shoreline. Entering the built-land, the sanbar land is like entering another planet. The cypress and typelo and wolf trees are all gone, replaced mostly by scrubby and storm-riven willow, sycamore and gum. The water here runs through shallow depressions between the sandbars, rather than in bayous. But still, there is much water. We met two fishermen from Pierre Part who were catching choupique (bowfin) in the rain. One of them fished lines strung out with hooks on them between bamboo poles for support. The other was gillnetting. Both had some of the big choupique that they sell for the eggs (roe, caviar). The eggs are worth $10 a pound this year, $14 last year. They gave me two males, useless to them of course, for my skeleton collection. And on home to the west side, in the rain. We stopped near Shatter’s Bayou and Oaklawn Canal to pick up some traps that EJ wanted to rework for this year. This swamp is pure tupelo in some places, and the rain marked the water level for last year in black contrast to the otherwise gray trunks. Interesting to see this reminder of the rising potential of the water. As we approached the landing at Myette Point, it stopped raining. No recordings of EJ, very few pictures for the day, and a soggy, fancy rainsuit. But was it a great day? Very much yes. I hope to go with EJ later this year while he runs traps, maybe not in the rain this time. The river is at 12.7 feet on the Butte La Rose gauge, falling to 11.9 by this time next week. Both the Ohio and Mississippi are falling pretty hard. Things could drop in that swamp if there is not more rain or snow in Ohio.